For International Faculty: once your appointment to SNU is made official, either your department office or Office of International Affairs will ask you to send necessary documents in order to process your visa application. All international students must obtain a D-2(student) visa before coming to Korea. Please visit the Korean embassy/consulate’s website in your home country and the check list of required documents for D-2 visa application. Certificate of Admission* is one of the required documents to process your visa application. It will be sent to the admitted students by airmail. Once you have all of the documents ready, submit them to the Korean embassy/consulate for your visa application. If you do not receive your admission certificate, please contact the applicable offices below. If you are eligible for F-4 (Overseas Korean) or E-3 (Researcher) or F-3 (Dependent Family), you may apply for these visa types since F-4, E-3 and F-3 visa allow visa holders to conduct study activities in Korea. To find out how to apply for these types of visa, please visit www.hikorea.go.kr. If you play to stay in Korea for more than 90 days, you must complete your alien registration within 30 days of arrival to Korea. Your Alien Registration Card (ARC) and the length of authorized stay (printed on the back of your ARC) must be valid during your stay in SNU. Once you enter Korea, your length of authorized stay (printed on the back of your ARC) will automatically become your valid visa period. If you want to continue working/stay in Korea, you must extend the visa period before it expires. If you fail to do so, you will be working/studying without a proper visa and thus be in violation of Korean immigration law. You must have a valid ARC to re-enter Korea after leaving Korea for sabbatical, sick leave, research leave, and generally, leave of absence, etc. If your ARC expires during your stay overseas, you must obtain a new visa before re-entering Korea. To apply for a new visa, please make the request to your department office or Office of International Affairs(i-office@snu.ac.kr). *In accordance with the Korean immigration law, your ARC and visa will automatically expire regardless of the original valid period (become voided) if you were not physically in Korea for a consecutive period of one year or longer, unless you obtain a re-entry permit before temporarily leaving Korea. Applying for a re-entry permit is possible only if your ARC is still valid when you come back to Korea. To apply for a re-entry permit, contact your department office or Office of International Affairs. If your ARC is found to be void upon your return to Korea, you will be asked to turn in your ARC at the international airport. Once this happens, you must apply for a new Alien Registration Card as your ARC and visa will no longer be valid. If you are staying in Korea for more than 90 days, you must complete your alien registration within 30 days of arrival to Korea. Once alien registration process is completed, you will receive your Alien Registration Card (ARC). Please carefully note that it takes 2~3 weeks for your ARC to be ready. It is recommended that you obtain a Certificate of Alien Registration (외국인등록 사실증명서) when you are applying for an Alien Registration Card (ARC) at the Immigration Office (Fee: 2,000 KRW). The Certificate will temporarily substitute for your ARC and can be used for school affairs until you formally receive your ARC. (However, please note that the Certificate of Alien Registration cannot be used to open a Korean bank account or be used to purchase mobile phone subscriptions). Certificate of Health Examination Form (only for those who are from the below listed 18 countries* and haven not submitted the Health Examination Form to the Korean embassy/consulate office in his/her home country when applying for a Korean visa). Please take a health examination at Gwanak-gu Community Health Center**. If you lose your Alien Registration Card, you must report the loss to the Immigration Office within 14 days of the occurrence of loss. If you do not report within the given time period, you will be fined. To report the loss of your ARC and apply for re-issuance, please prepare the documents listed below and submit them to the Seoul/Sejongro Immigration Office. You must report any changes that may affect the status of your alien registration, as listed below, within 14 days of the occurrence of change. If you do not report within 14 days, you will be fined. You may report the change of address at the Gwanak District Office. However, all other changes must be reported to the Immigration Office. A request for an extension can be made from 60 days before the expiration date. The application for the extension can be made through the online immigration system (www.hikorea.go.kr). For online applications, there will be a discount of processing fees from KRW 60,000 to KRW 56,000 . If you are already in Korea and your family wishes to join you, they must apply for their respective visas at the Korean embassy/consulate office in their home country. Note that minors (under 18 years) do NOT have to register their fingerprints. Application for extension is possible from 60 days before the visa expiry date. Parents who have given birth to a baby in Korea must apply for an alien registration for their child within 90 days of the date of birth. As it may take several months to obtain the baby’s passport from your home country, please apply for it as soon as possible. Baby’s passport from your home country (this process may take some time, so please begin the process as early as possible). If your visa is for single entry and you wish to leave Korea for a trip, make sure to obtain your Alien Registration Card (ARC) before your departure. Otherwise, you will not be able to re-enter Korea on the same visa. If you have completed your alien registration, the single entry visa is automatically change to a multiple entry visa. Those with the C4 single entry visa cannot return to Korea on the same visa. If you need more information on the immigration procedures or other related issues, please contact the Korean Immigration Call Center. It is illegal for D-2 visa holders to obtain work outside of the university and earn an income without prior permission for activities outside the visa status. To obtain permission, you will need to submit the following forms and complete the necessary process before you can begin your work. Once part-time work permission is authorized, undergraduate level students can work up to 20 hours per week. Graduate level (Master’s level and above) can work up to 30 hours per week. There is no limit on time during weekends and vacations. 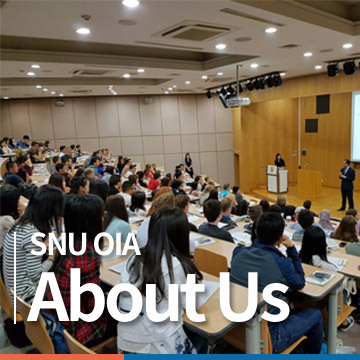 An SNU international student who takes a Leave of Absence(휴학) or No Leave of Absence(미휴학파견/participating on an exchange program outside of Korea) will be deemed to have stopped their study in Korea. This change in the student status must be reported to the Immigration Office by the OIA. You must leave Korea within 30 days from the date of occurrence. Upon your report of the occurrence, your authorized length of stay will be automatically shortened regardless of the period printed on your visa or the dates printed on your ARC. Furthermore, your ARC will be voided based on the change in your alien registration. You must turn in your ARC at the international airport when you depart from Korea. To reenter Korea, you must acquire a new student visa (D-2), which in turn means that you need a new Certificate of Admission. When you apply for a new student visa, please contact the OIA for a Certificate of Admission. As you have turned in your ARC at the international airport upon your departure, you must apply for a new one upon your return to Korea. If you visit the Immigration office without making an appointment, you will not be able to apply for applications. Please see the attached guides for how to make an appointment at the Immigration Office in Korea.